I’m heading to Greenwich this morning by ferry, so after another fine breakfast at the Rubens, I take my usual route down Birdcage Walk toward Westminster Bridge. 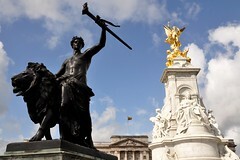 When I reach the corner of St. James’s Park I look over at Buckingham Palace to admire the view. For the first time since my arrival, the Victoria Monument is unencumbered by scaffolding and stage lights for the Diamond Jubilee and traffic is flowing freely. At the palace, the Royal Standard is flying high overhead and that means that the Queen is home. Of course she is. Tomorrow is the annual Trooping of the Colour, which means yet another carriage procession, and yet another balcony appearance, with more smiles and more waves. What a strange life it must be. I walk all the way down to Embankment, intending to take the Thames Clipper to Greenwich Pier, but it breaks down along way and we have wait to change vessels. Dense clouds have formed overhead and a stiff wind is kicking up, which makes the river choppy. Once back on the water, I retreat inside the cabin, pull my scarf tight, and watch raindrops gather on the window as we pass the Monument, Shakespeare’s Globe, St. Paul’s Cathedral, and Tower Bridge. By the time we arrive in Greenwich an hour later, I’m properly seasick. I’ve booked an 11:00 AM reservation to see the Cutty Sark and because of the mechanical difficulties we had along the way, it’s already a quarter past, so there’s no time to sit and gather my bearings. I’ve got to plow on. 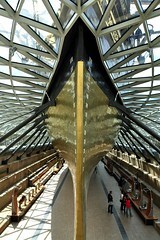 Built in 1869, the Cutty Sark was one of the last, great clipper ships to sail during the tea trade. 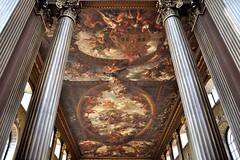 It was nearly destroyed by a fire in 2007 and its restoration in the years since has become a source of national pride. The ship may be dry docked permanently for public display, but as I walk through the hull, trying to focus on the exhibits, I can still feel the rocking and swaying of the ferry that brought me here. I take a few pictures, then make a hasty retreat in search of fresh air. Next, I explore the halls of the National Maritime Museum. Through the years, I’ve passed through London’s Trafalgar Square many times and I’ve always liked Nelson’s Column, with its protective ring of bronze lions at the base, so I’m especially pleased to see Admiral Nelson’s bloodied uniform from the Battle of Trafalgar in 1805. I check the time on my watch. It’s nearly 2:00 PM and I’ve reserved a ticket online to see a special exhibition titled “Royal River: Power, Pageantry and the Thames.” I pause for a long while in front of Canaletto’s canvas of “The Thames on Lord Mayor’s Day” in 1746, marveling at its minute details. Perhaps it’s artistic license, and just maybe it’s the blue sky overhead, but compared to the Diamond Jubilee river pageant two weeks ago, things looked rather more grand back then. I feel like a traitor for saying so, but it’s true. 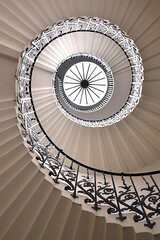 I trudge on to the Queen’s House to see the tulip staircase, but my stomach does flip flops when I look down at the geometric floor of the Great Hall from the balcony above. I’m really flagging now, but I’m determined to check one more item off my list. 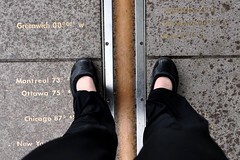 I can’t leave Greenwich without standing on the Prime Meridian. On the long walk up the hill to the Royal Observatory, I have to stop twice to rest on park benches, but I make it to the top and through the museum, past a portrait of John Harrison and the timekeepers he designed that finally solved the Longitude Problem in the mid-18th century, out into the courtyard. I have stood, it says, at the “home of time.” And with that, I am well satisfied. Back in London, I’m thankful that I have a few hours to recuperate before dinner at L’Arco and a night at the theatre. 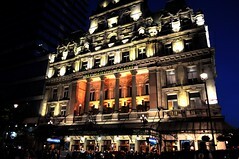 I’m going to see “The Phantom of the Opera” at Her Majesty’s Theatre near Covent Garden, and I have a wonderful seat in Row G of the Stalls. Maybe it’s because I’ve been feeling sick all day, but I’m in a melancholy mood. Phantom premiered in 1986, the year I graduated from high school, and my sister Patti bought me the soundtrack on a set of cassette tapes for my birthday. As a teenager, I never imagined that I would ever travel to London to see it performed live on stage, and yet many years later, here I am. 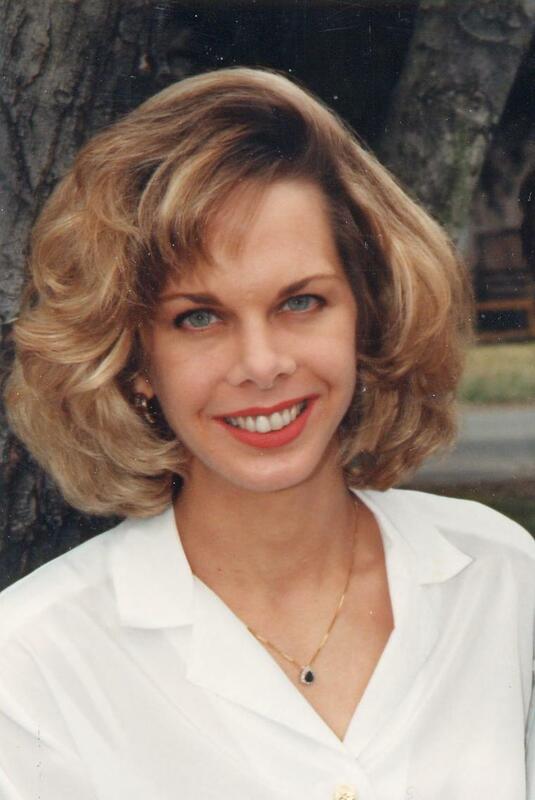 My sister—who died young—is not. I can’t help but think of Patti and of how much she would have enjoyed this trip—the royal parade, the tea at Claridge’s, the window shopping on Oxford Street, and the tromp through Bath and the Cotswolds in the footsteps of Jane Austen. In an unexpected way, all of this comforts me, because it draws her memory close.